Walk toward the tree-lined side of the Piazzale Roma. Continue through the trees to the water. Turn right onto the fondamenta or sidewalk along the canal. A few meters ahead, you'll see a food kiosk just before the Tre Ponti (three bridges). Bearing left to stay by the main canal, walk past the food kiosk to the bridge. Cross the bridge and immediately turn right. 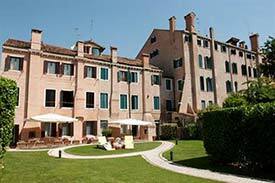 Walk past the Hotel Arlecchino (a sister hotel that we also recommend). The Hotel Olimpia is just beyond the tiny cross street by the Hotel Arlecchino's entrance. As you leave the train station, turn right and follow the crowd toward the modern Calatrava Bridge. Cross the Calatrava Bridge (officially named the "Ponte della Costituzione") to the Piazzale Roma, then follow the directions above. Take the People Mover elevated tramway to the Piazzale Roma. Once you're in the Piazzale Roma, follow the directions above.